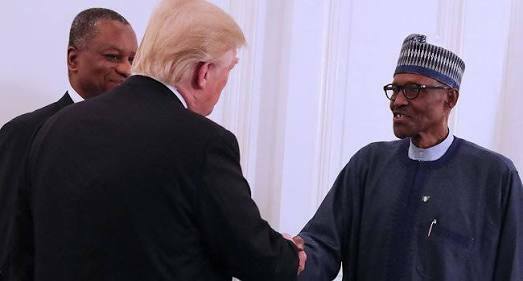 The Peoples Democratic Party (PDP) has called on United States (US) President Donald Trump to use the opportunity of President Muhammadu Buhari’s visit to the US to prevail on the Nigerian leader to return the nation to the path of constitutionality and justice. Trump The party in a ‘State of the Nation’ address accused the Presidency of harassment of opposition figures even as it drew the attention of the world to the what it called the mindless killings going on in different parts of the country. While stressing that life in the country was gradually returning to a state of nature, the major opposition party added that what currently obtains in the land is nothing different from the military era of 1984 when Buhari first called the shots as a military Head of State. Addressing journalists at the party’s national secretariat, National Publicity Secretary, Kola Ologbondiyan, accused the Buhari administration of human rights violation, detention of key opposition elements without trial, amongst sundry infractions. “We urge President Donald Trump to stand up for democracy and take President Buhari to task on constitutional and human rights violations in Nigeria under his watch, as already detailed in the report by the US Department of State. “President Muhammadu Buhari is on his way to the United States, the home of democracy, whereas back home in Nigeria his administration has completely wrecked our democratic order, eroded constitutionally guaranteed rights of citizens while foisting a siege mentality on our people”.